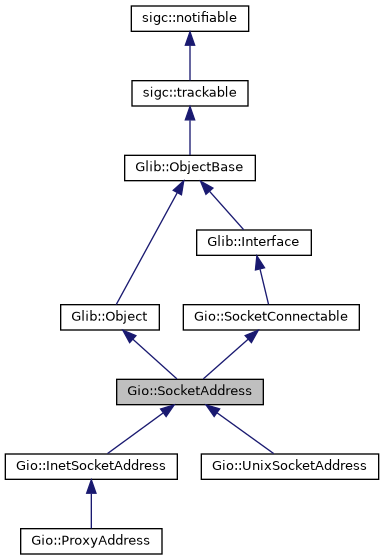 Abstract base class representing endpoints for socket communication. Creates a SocketAddress subclass corresponding to the native struct sockaddr native. native A pointer to a struct sockaddr. len The size of the memory location pointed to by native. A new SocketAddress if native could successfully be converted, otherwise nullptr. Gets the socket family type of address. The socket family type of address. Gets the size of address's native struct sockaddr. You can use this to allocate memory to pass to g_socket_address_to_native(). The size of the native struct sockaddr that address represents. Converts a SocketAddress to a native struct sockaddr, which can be passed to low-level functions like connect() or bind(). If not enough space is available, a Gio::Error::NO_SPACE error is returned. If the address type is not known on the system then a Gio::Error::NOT_SUPPORTED error is returned. dest A pointer to a memory location that will contain the native struct sockaddr. destlen The size of dest. Must be at least as large as g_socket_address_get_native_size(). true if dest was filled in, false on error.